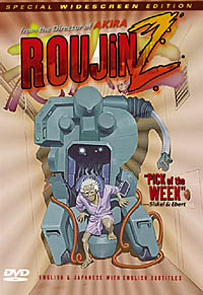 In 1991, a Japanese animation studio released a film about a dying, elderly man being rushed to the shore by the artificially intelligent mech he’s hooked up to. That piece of AI, the Z-001, is the key tool in an experiment to see if the needs of the infirm can be meet by solely by technology. In Roujin Z, the Japan’s Ministry of Public Health wants to facilitate that world–one where there’s not just a buffer between people and the inevitabilities of old age, but a buffer perfected to an inhuman degree. Widower Kijyuro Takazawa is the Z-001’s test subject. His nurse, Haruko, isn’t elated at the proposition of Takazawa being wired into the would-be hospital bed of the future. For all the Z-001’s bells and whistles, it apparently doesn’t leave Takazawa with much of a sense of independence. When he calls out to Haruko through the machine, she finds plenty of human roadblocks to getting him out of the thing. All she can manage is to get a few hackers to integrate the voice of Takazawa’s late wife into Takazawa’s machine-incubated world–for the sake of comforting him. Once the integration happens, the Z-001’s AI becomes a little more human. Beyond mechanically taking care of Takazawa’s physical needs and providing entertainment–it, like his wife would have, wants to give him what he really wishes for: another trip to the beach. It begins fusing itself with other machines and bulldozing its way there, with the Z-001’s weapon-oriented counterpart on its tail. Especially now, in the age of distancing ourselves as far away from the eventuality that our bodies will fail as possible, the existence of Roujin Z, written by Katsuhiro Otomo (creator of Akira) seems like something of a miracle. Have you ever watched even a snippet of an infomercial lately? Preserving or regaining youth and vitality is pretty much all they’re about. That used to be more subtle. The ones for juicing machines used to be more about quality and saving money on the store-bought variety than all the health benefits. This isn’t to say one shouldn’t try to cultivate good health. It certainly shouldn’t be the exclusive domain of people who live in places in which the quality-of-life virtues are constantly praised. The strength of the positives you eke out beyond quality as a given is one of the things that make a non-charmed (or, really, any) life worth living. Even in product ads primarily directed at seniors, there’s a vast chasm between the maintenance of life and one’s body giving out. But live long enough, and that’s what happens. When it does, it’s hardly guaranteed for people to be close to the best of what they’ve loved in this world. Even the tenacity of cutting edge technology enhanced with a dash of humanity will not likely be there to carry one through to such in bulldozer-like style. So old-fashioned humanity is often all there is, but that can be a lot.